There's a reason some big, non-endemic brands are apprehensive about hitching their wagon to Counter-Strike: Global Offensive, and it has a lot to do with a single word: Terrorists. 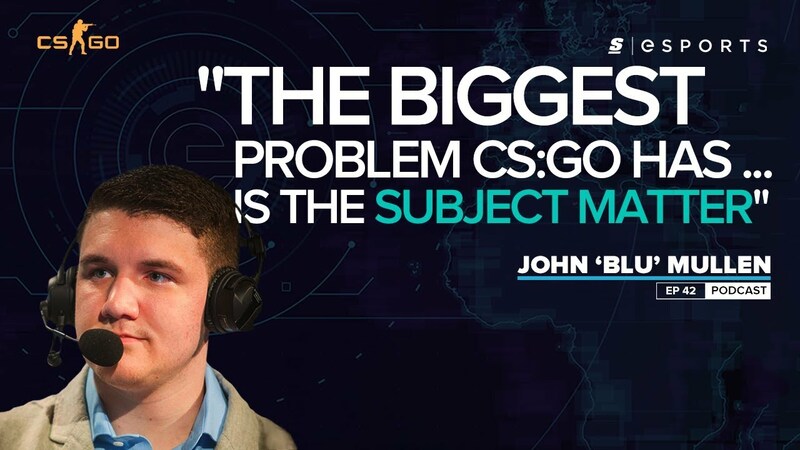 CS:GO broadcast personality John "BLU" Mullen thinks the use of terms like Terrorist and Counter-Terrorist in today's political climate is a big factor in why some brands are skittish about entering the scene. But for him, that's not necessarily a bad thing. "I think honestly the biggest problem CS:GO has, especially when we look at these traditional sports and just non-endemic investors coming into esports, the biggest problem that CS:GO seems to have is the subject matter from what I've found," he told theScore esports Podcast. "And this is pretty obvious, it's like Terrorists and things like that, and that's obviously a big issue in the world right now. So I've noticed there's a lot of brands that aren't necessarily inherently connected to video games that don't even want to touch that. Especially in the TV space, the normal sports space," he said. "There was the issue when ESPN esports first got announced and they weren't really covering CS:GO for the first couple of months, and that eventually had to change because it was such a big game. But just things like that seem to be holding CS:GO back." These comments echo similar ones made by Space Soldiers' İsmailcan "XANTARES" Dörtkardeş on the use of "Terrorists" and how it can drive away sponsorship. That's especially the case for a Turkish-based organization, where the association with terrorism-related violence can be more sensitive. BLU suggested this isn't all a bad thing, though. "I think there [are] some perks in the fact that we're not getting this investor money as it is creating a bubble, I do fear, in a lot of these other games, and especially the North American esports ecosystem." BLU also shared his concerns about Blizzard's upcoming Overwatch League, which for him, "could make or break North American esports." "The Overwatch League is such an unnatural escalation of that, to the point where if it goes badly it could send everything crashing down to the ground. That has me very, very worried." BLU said. "There was that interview that Richard Lewis did a couple weeks back, and my thoughts on it are almost exactly the same. The game is very hard to spectate... it's just a very hard game to watch, even if you play it, even if you know the characters." BLU also was exasperated by the notion of league teams having two separate brands, with potential difficulties and even restrictions on how those brands actually can interact with one another. Overwatch League teams are required to have distinct branding, different from their parent organizations'. Even further, BLU and the podcast hosts explored the difficulties of geolocation and feeling attached to rosters that may be completely foreign, potentially making emotional attachment for fans will be hard. "It definitely seems, I hesitate to say malicious, but i'm going to use it because I can't think of another word right now. It almost seems like they're trying to hold these brands hostage, where we're not going to let your brand get any additional recognition off of this and you have to establish a new one. Then, it has to work within our ecosystem in order for it to grow." Colin McNeil, Josh Bury, Gabriel Zoltan-Johan and Dennis Gonzales are editors for theScore esports. You can follow them on Twitter.